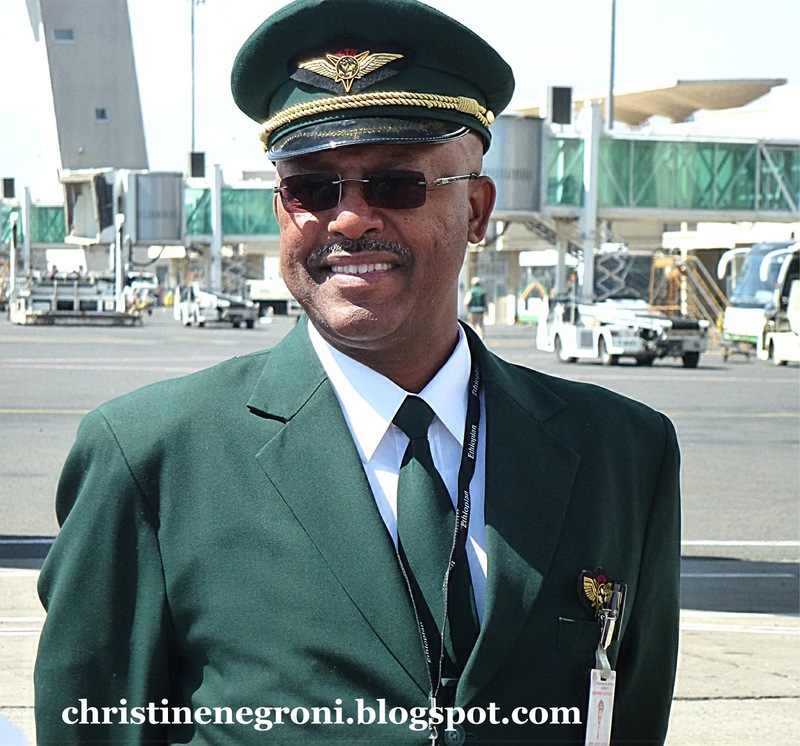 Flying Lessons: Can This Be a Dream? Dreamliners Ready to Roll? The night is not quiet, the bullfrogs in Charleston are making a racket. Sandy Ketchen, the driver from my hotel and I are not so far from the airport that the jet engines can't be heard faintly in the distance. Still, the night is balmy and anticipatory. Or maybe the night is just the night and I'm the one who is anticipatory. But that's because I know - and the froggies probably don't - that tomorrow, their love songs will be completely drowned out when thousands of spectators, journalists, politicians, proud citizens and eager aviation geeks descend on the Boeing 787 assembly plant here in Charleston, South Carolina. Tomorrow, you see, the first product finished here will roll off the line. Eee Gads! Tonight I told my friend, retired airline captain Fred Arenas, "There are so many stories here I don't know where to start." There's the story of the plane, late by a couple of years, sure, but still "game changing" as the Boeing folks constantly insist. There's the story of the community that wooed the factory and won and the story of the company that did an end run around its union by creating 3800 jobs in a right-to-work state. There's the still-to-be written story of what will be the long-term effect of that business decision on the economy of Boeing's other manufacturing center that be the one on the other side of the country. Wait a minute, that's a lot of stories to be written. Right. Okay. Tomorrow, I'll get on that. Tonight, let me just go back and in the spirit of the chirping bullfrogs oblivious to the chaos into which they will be thrust in the morn, and wax a little soppy about the 787 I've experienced so far. 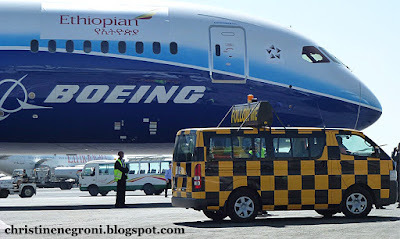 I've visited the factory in Everett, Washington but I've only seen the real-live-flying Dreamliner once, when Boeing and Ethiopian Airlines Capt. Desta Zeru flew it into Africa in December 2011. She was parked on the tarmac at Bole International Airport in Addis Ababa preening in the sun for three days. The truck says, "follow me"
This is an especially exciting day for me as well since I received my type rating on the 787 earlier this month and now am just waiting for the airpanes to arrive!! I was the first United (former Continental) line pilot to get trained. We have a beautiful new simulator, the visual is AWESOME! Looking out the side windows is just like the real airplane. 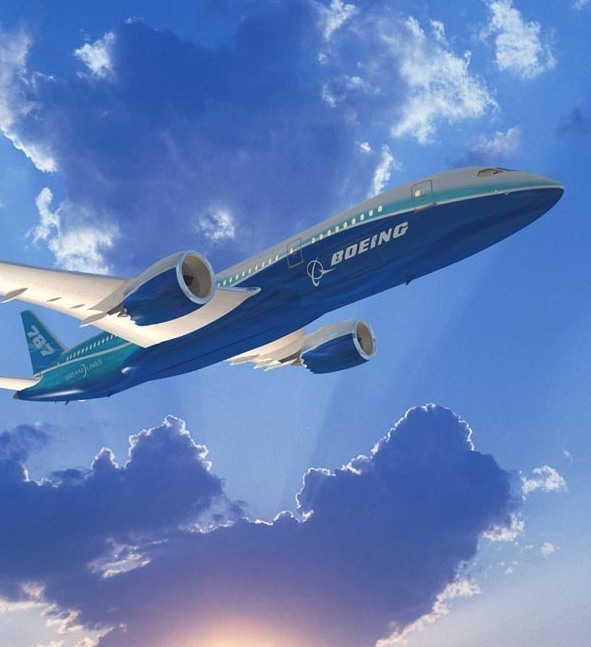 Another milestone for the Dreamliner program.